Coker fractionators are subject to damaging pressure surges due to accidental flashing of water. The pressure surges results in the tray decks “ripping” away from the tray support rings. Actually, the tray decks are not ripped away from the support ring. Inspection of damaged trays indicates the decks have been bent at the ring. The trays are not bolted to the tray ring; they are clipped to the support ring (see Fig. 3-5). In the course of bending, the tray pulls the tray clips away from the support ring. Ordinarily, 1 2-gauge tray decks have little structural strength. The real strength of a tray deck is located in the support lip shown in Figure 3-5. Unfortunately there is no way to attach the support lip to the tray ring. 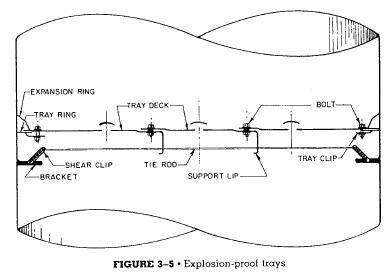 Hence the force of a pressure surge must be borne by the 12-gauge tray deck where the tray is clipped to the ring. As 12-gauge steel does not have much strength to resist the bending moment developed against the tray by the pressure surge; the tray is bent at the tray ring. To avoid this problem of intrinsic tray weakness, the support lips (also called “integral trusses”) are attached to the vessel wall. As shown in Figure 3-5, a bracket is welded onto the vessel wall below the ring. The support lip is attached to this bracket with a “shear clip.” Now the trays’ integral truss is attached to the vessel wall. The shear clip must be designed to break away from the vessel wall at some predetermined stress. Otherwise, a powerful pressure surge could deform the wall of the vessel itself. However, if the shear clips can be designed to be strong enough to withstand a AP across the tray deck of about 0.6 psi (i.e., about 2 ft of hydrocarbon liquid) the downcomers would blow clear before the shear clips would fail. Hence, the downcomers would act as a partial safety bypass and protect the tray decks from damage.